This is the hardest one. You need to take a cold, hard look in the mirror and know whether you can make a real success of the campaign – better than any other agency. Sure, you might be able to win the account, but can your team knock the execution out of the park? Some clients feel right and are on home turf, others are a logical extension. It’s the ones which are two degrees of separation from your domain that are probably best passed up. Just be honest about what you are good at – that will help your client’s reputation and yours. Does this client fit in terms of the scope of the program? Yes, in terms of budget but also the types of activities you’ll be doing. You don’t want a skinny scope where you can’t make a difference. Harder to turn away are the outsized clients you’d love to win, but just don’t have the resources to handle. True, someone has to be the largest client and you need to stretch, but don’t let the current roster suffer as a cuckoo client takes over. If a client is 50% larger than the next or more than 20% of revenues, think carefully whether you are the right firm. You have to develop a sixth sense about what the main client contact will be like to work with. This is important for both parties since we each have different working styles. You can’t allow a dysfunctional relationship to develop – it’ll cost you time, energy and potentially staff. The best time to prevent that is before you engage. Is this company a winner? You want to work with companies you believe in and that will succeed. They want a team which is committed and on-side. Late market followers or startups which can’t execute are hard to promote and often fail. By contrast, the leaders and disruptors tend to be bolder in their marketing, push harder, hire A-grade staff, and have a more robust pipeline of developments, which goes to fuel future success. How does this company view marketing? 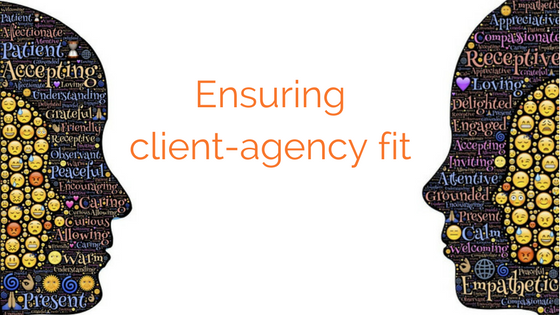 Are you going to be a partner or does the company have a track record of churning agencies? That can signal internal issues which they should resolve before engaging another firm. No prospect who in good faith approaches an agency wants to feel like they are being ‘qualified’. I still hear tales of companies getting turned down flat because their budget is lower than $20k or whatever. That just comes off as self-important and frankly rude. In those first interactions, we’re both looking for the foundations of a successful long-term campaign. It’s in all our interests to guide prospects through that process smoothly, even if it’s not a client-agency fit. But done well, I’ve found these guidelines to be useful in determining if my firm is a match, and in referring clients on when it isn’t. And I’ve found the resulting campaigns and relationships to be the stronger for it.